Oh my gosh- we are so close to getting through December. How are you doing? Are you getting through? Celebrate every moment of your recovery- I don’t just mean to celebrate if you’ve had a day or a week without a binge, but when you wake up in the morning and eat a healthy breakfast, give yourself accolades and support. The more support you give yourself, the more you encourage yourself, the easier recovery will be. Baby steps are crucially important in all stages of recovery. That’s because as disordered eaters- we tend to be so black and white, so all-or-nothing. If you are able to find joy and encouragement for yourself in each small success (passing by a scale and choosing not to step on it, seeing on Facebook that your ex-boyfriend or girlfriend is having a baby and not running to your binge foods, getting stressed out on a road trip or on your way to work and not stopping at the fast food place– all these are big successes) you will find that you get closer and closer to recovery. Think of how much better children do when they are encouraged. We never lose that. We want accolades and validation not just from the people around us, but from ourselves. 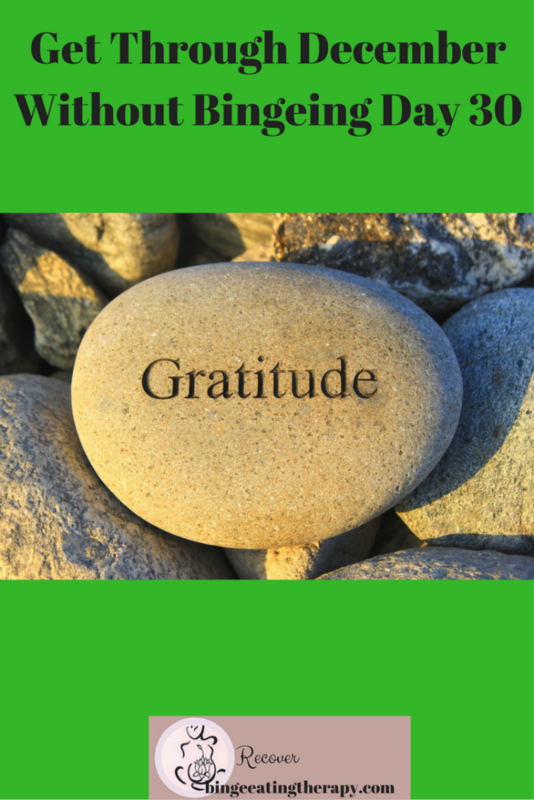 Even the most stressful or frustrating event or day deserves acknowledgement. You’ve made it through and have succeeded in facing difficult challenges and opportunities. That means you are that much better equipped to face the next challenge and you are closer to being on the other side- the easier side of recovery. So close to saying buh bye to 2016- phew. It’s been a difficult year for many. If you have been following me for even a minute, you know that I’m a huge advocate of self-regulation through mindfulness and meditation. The thing is though, it’s not one of those things that’s immediately noticeable (like highlights or a haircut) however, it is noticeable. Not just to you, but to the people around you. I have a client who I challenged to do 4 out of 7 days of meditation each week for one month. She is someone who has an overwhelmingly stressful job – life and death every moment that she’s on duty- her adrenals never get a break. She told me that she felt better after her very first session and couldn’t wait to do more. After just a few weeks she told me that people at her work told her that they loved working with her because she was so grounded and so even keeled and that she had a calming energy about her. My favorite free mediation app is called insight timer and you can download it here. I love this quote because it’s so relevant to people who deal with the ED schema. So many people tend to put so much of themselves, so much care, so much support into others but forget about their own care. Remembering that you too are just as deserving and entitled to care, love and support is crucial for feeling your value and your worth and allowing yourself to recover. Did you know that each year 62% of Americans make New Years Resolutions and of those 62% only 8% are able to stick to them? That means that almost 197 million people make resolutions and 140 million of those people give up on those. This makes setting resolutions a pretty big set-up for failure and unhappiness. 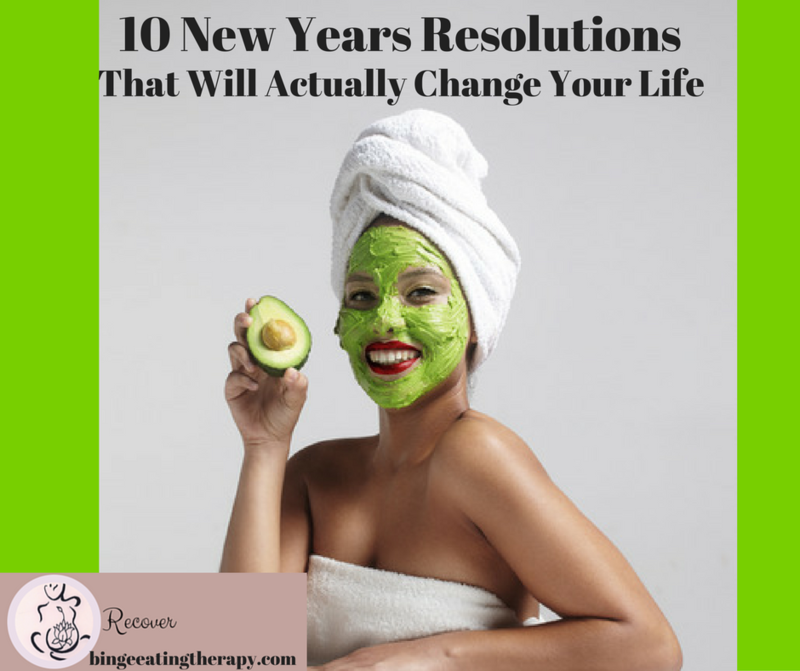 Do you know what the number one most common New Years resolution? I’m sure you can guess that one easily — lose weight! Unfortunately though, despite your best intentions for improving your life, New Years resolutions tend to make people miserable as people usually fail at them by the second week in January. Women and men alike have been trained to look in the mirror and ask themselves, “what is wrong with me? what can I change? how can I be better or different?” Advertisers would never be able to sell anything if they never convinced you that there was anything wrong with you. For instance, who ever said that wrinkles were a bad thing? Someone had to in order to sell eye cream, facial moisturizer, Botox, Restalyn and all those other things. It’s a brilliant scheme because, well EVERYONE AGES (if they’re lucky!) so a market has been founded to engage every human being and convince them that something is wrong with them even though their skin is doing what everyone’s skin does. Now they can tell people that it’s wrong and needs to be corrected. And then guess what? They sell you something! How genius. So every time you look in the mirror, you’re scanning for “what’s wrong with me?” so you can then look for something to fix it. And YOU WILL find someone to sell you something to fix whatever you are seeing that you believe is wrong. Strange, huh? What if you instead asked the question “what’s right with me?” You could also choose to counter all the mean (internal advertising executive) voices with a simple “I’m fine.” You can always fabricate something to dislike about yourself. But in finding what’s right or what’s “fine,” you stop buying into a society that perpetuates the use of self-hatred to make sales. How to do it: Notice when you start focusing on all of your PERCEIVED flaws and take yourself back. Take a breath and tell yourself, “I’m fine. Who I am is fine. I don’t need to support the beauty industry by looking for things to fix about myself. It’s all a well-engineered scam to seduce me out of my money. How it will change your life: You will stop picking on yourself all the time and you will feel less stress and anxiety generally speaking. You will feel more confident and more peaceful just being in your skin. 2. Resolve to stop supporting a media that devalues women. How to do it: Stop buying fashion magazines and “health and fitness” magazines that tout the same tired articles on how to lose 10 pounds this month or how to torch 500 calories in one workout, and how to get rid of cellulite for good and those that use diet pills, powders and potions as their sponsors. There are only so many diets and so many workouts, yet these magazines seem to be able to repackage the same information over and over again for years on end. Stop following Instagram and Pinterest Fitspo folks who just wind up making you feel bad about yourself. Stop following social media influencers who are paid to push products that promise to make you more like them. 3. Resolve to stop comparing yourself to other people. How to do it: When you find yourself going to the place of, “my life would be so much better if I made as much money as…” or “everyone has someone to spend Valentines Day with except for me…” stop yourself immediately. Think of a big stop sign in your mind and say to yourself, “no. I’m not going there.” Remember that everyone has their own path, their own Dharma. When you look to someone else’s path you stop moving along your own. You become paralyzed and you’re unable to allow your life unfold the way beautifully and the way it’s supposed to. How it will change your life: You will actually be able to focus on going forward in your life given what you have. You will be able to appreciate and enjoy the things and the people who are in your life rather than feeling disconnected to what you do have. You will find that when you look at and enjoy what you do have rather than what you don’t have you will generally be happier. You will also be able to enhance and make more of the good things in your life because you will be moving forward in joy and able to appreciate those around you rather than stuck in envy. 4. Resolve to stop spending buying money on miracle potions and weight loss/diet shakes or other gimmicks. How to do it: Stop looking for the next miracle skin cream or beauty potion or pre-packaged meal or shake program that will make you perfect. Stick to one simple skin care regimen that you enjoy and that you can afford. Keep your diet healthy (lots of fresh fruits and vegetables) and get fresh air and exercise. How it will change your life: It will take away the stress and anxiety about buying something every time you see a commercial or read an article about how different your skin will look and be when you get this one product. It will reduce waste in your life and it will keep you from spending excessive cash on something disposable. How it will change your life: Letting go of negativity and criticism will feel better in your body. You will feel lighter and more at peace. You will also find that people around you trust you more. They will know that their secrets are safe with you and that they are able to talk to you without fear of judgement or criticism. It will take a big weight off of you and give you more mind space to concentrate on yourself and your own needs. The people around you might just decide to jump on your bandwagon making your circle more pleasant to be around. How to do it: Stop talking about how fat you are. Stop talking about how much weight you need to lose. Stop talking about diets. Stop talking about who has gained or lost weight. Stop commenting on other people’s weight either to their face or behind their back, even if it’s “Wow you lost so much weight…” Make a choice to not engage with any talk about other people’s bodies or your own. How it Will Change your life: You are choosing not to participate in a society that judges women for the way their bodies look and for how much they weigh. You create a positive example for those around you and you have done something to change the way people judge people by looking at how much they weigh. When you engage in fat chat, you are contributing to the continuing exploitation of women’s bodies, making it okay for the media to perpetuate the myth of the perfect female form. Change starts with you. How to do it: Make doing things that you love a priority. Carve out time for them every day. If you love to write, give yourself 1/2 hour a day to write. If you love to knit, or sew, or ride your motorcycle, or take photographs, or read, or garden or play with your cat, or go swimming, or draw, paint or sculpt, or sing, make sure that it is something that you do several times a week. It’s so common that people prioritize cleaning the house and paying the bills and never feel like you never have time to do the things that you love. You have the power to make your life enjoyable. When you go into super-functional mode and stop paying attention to the things that give you pleasure, you feel as though you’re just moving through life crossing things off your “to do” list. Some things should be done not to get them done, but for pure pleasure. Don’t reward yourself by vowing to draw after the dishes are done, make drawing a priority. Put it on your list for sometime during the day, not in the evening after all your chores are done. Do it on your lunch break. Make time for you. How It Will Change Your Life: It will help you to appreciate and enjoy your life, it will make you an active participant in your life so that you can enjoy the day-by-day, not be bored waiting for the next thing to happen. How to do it: Remember that nobody’s opinion is any more important or any better than your own. So try to have a high opinion of yourself. Hold yourself with integrity– become the person who you admire. When you are holding yourself with integrity (that means being compassionate, kind, not lying or stealing or hurting anyone, holding the highest intention for good), you will know that nobody else’s opinion of you matters because you are a good person. Remember that most people don’t have the time or the energy to spend time thinking about you– they are spending most of their time thinking about themselves. If they are wasting their time thinking about you, well then congratulations, you’ve got lots of power! How it Will Change Your Life: You will have the freedom to live your life the way you want without the weight of the fear of criticism of others. You will feel lighter and enjoy life more. How to do It: Do volunteer work at the SPCA or your local homeless shelter or soup kitchen. Find something that you’d be interested in doing at Volunteer Match. How it Will Change Your Life: Studies have actually found that people who volunteer have lower mortality rates and less chronic pain and heart disease. This is because of the sense of community and sharing volunteer work creates. It also reduces isolation (key in healing from eating issues) and increases self esteem and life satisfaction. It also widens your perspective. It’s difficult to dwell on your problems or get caught up in the drama in your own head when you’re spending time helping others. How to do it: Take 30 days to go on a spending fast where you buy nothing except for true essentials, such as food and hygienic products; no fancy bottled water, no takeout, no fancy meals, no bottles of wine, no fancy soaps, no new clothes, no new jewelry, nothing– just what you really really need. How it Will Change Your Life: You will find some relief in not having to worry about what dress to buy but knowing that you have a dress at home. You won’t worry about walking into Target for a bottle of shampoo and coming out having spent $150 on razors and lotion, and you won’t have to deal with a late night pizza binge. You will find relief in not having to think too much about what to buy. A spending fast, even for a month is a huge relief. How to do it: Use mindfulness to check in with yourself throughout the day. Set a timer on your phone to go off once every few hours. When it goes off, stop and ask yourself, “what am I feeling?” If you don’t know, check this list of feelings . Then practice just sitting with that feeling without doing anything to change it. How it Will Change Your Life: As you learn to be aware of what you are feeling throughout the day, you won’t surprisingly find yourself engaged in activities that you have previously done to avoid feeling, for instance, you won’t find yourself eating when you are anxious because you will know that you have the capacity to sit with uncomfortable feelings. What do you think, can you make a few of these changes? You don’t have to be perfect or do them all the time, but I’m betting that if you chose even just one of these, it would make significant positive changes in your life. Try it! Let me know how it goes. I love this quote of course because it is so illustrative of what we tend to believe- that we should be able to snap our fingers and be done once and for all with whatever habit (of the cognitive behavioral kind or physical behavioral kind) that we’ve been doing our whole lives. Patience is a wonderful trait to cultivate. Patience with yourself will get you the furthest along. 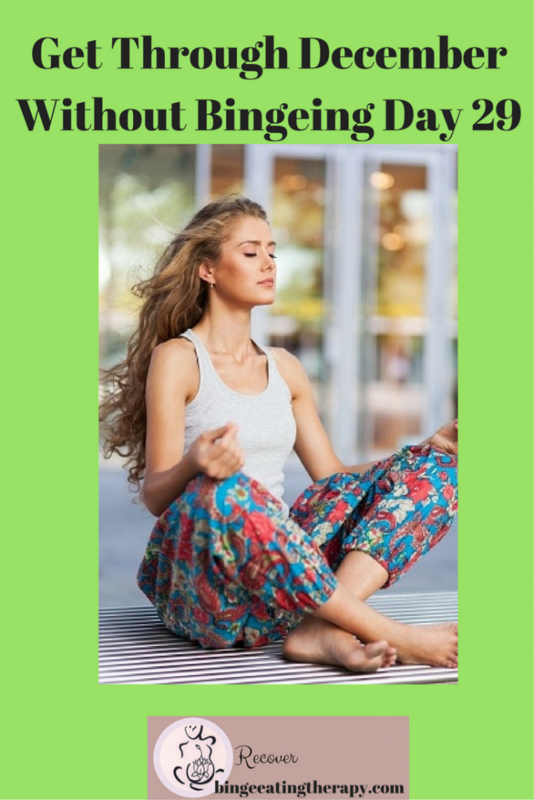 It will keep you peaceful, calm, protect you from self-loathing and anger at yourself and bring your closer to achieving your most important goals. Here we are – just 4 days before 2019 starts. How has December been going for you so far? Don’t “last hurrah,” it. These last few days are rough. There are lots of leftovers, lots of big boxes and tins full of cookies and baked goods, and the temptation to say “Screw it, I’ll just binge until New Years Day and then start my diet on January 1st…” is big. The problem with that is – that you feel terrible on New Years Day. You feel sick to your stomach, you are bloated, you are depressed and your body just feels not right. And then you start the whole cycle over again. You tell yourself that this is your year, that in 2017 you’re finally going to lose the weight. And then you diet for the first week or so of January and then you’re bingeing again. You don’t have to do that again. 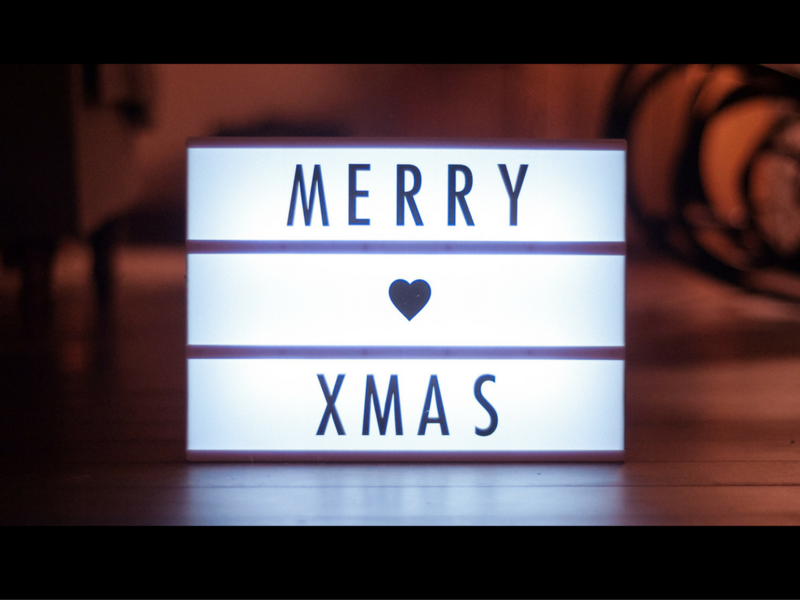 If everything in December leading up to Christmas was about food – everything in December leading up to New Years is about weight loss and fitness. It’s okay to be fit, but fit has nothing to do with pejorative dieting. It’s about creating balance for yourself. It’s about finding within you the most easy way to live both physically and emotionally, it’s about not eating too much and not eating too little. It’s about not going to sleep hungry and distraught or full and distraught. It’s about finding satisfaction in being even. 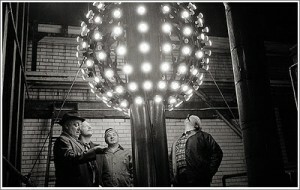 What about deciding not to go on a diet for New Years and not to last hurrah it in the days leading up to New Years? What about saying at this moment that you are finding your balance. Right this second. You don’t have to wait, you can do it immediately. Balance is as simple as quieting down all the talk around you and quieting down the mind that tells you to binge or diet and asking yourself, “what do I need to be the kind of me that makes me feel peaceful? Not too much, not too little, but okay just being me?” and then trust that. You might hear that you need to relax more, you might hear that you need to take more walks, you might hear that you need to drink more water or eat more fruit or talk to your mother more or dance or read or stretch more… What is it that can help you at this very moment be the you that you really are? What is inside of you that helps you be you? Put your hand over your heart and breath deeply and ask yourself, “if my heart knew exactly what I needed right now, what would it tell me?” and then listen to your heart. You will learn something amazing about yourself. I love this quote because it reminds us that we waste so much of our time and energy trying to change ourselves. When we value ourselves for who we are, we stop wasting time on trying to make ourselves different. It is only then, out of self-love not self-hate that we transform ourselves. When we try to change ourselves, we come from a place of “I’m not worthy until I lose weight, get thin, fit into a certain size…” and we put off doing our lives. When we value ourselves we use our time now and we participate in our lives now and ironically, that’s how we enhance, improve and evolve. Oh wow, we are on the other side of the holiday weekend. Phew! I am expecting that most everyone indulged over the holiday weekend. It was a big weekend no matter what holiday you celebrate. Most people likely either traveled, had family in town, attended or hosted multiple big celebrations. And you likely woke up Monday or this morning feeling bloated and uncomfortable in your skin. Not just you, but everyone. You probably ate foods that you never eat, your body is probably not processing them as smoothly as it does the foods that its used to and you are likely retaining water- feeling swollen and possibly feeling depressed and out of sorts because your body just doesn’t feel right. It’s okay. I want to say to forgive yourself, but you have nothing to apologize for. The holiday season is part of life. Sharing food and joyous times together (and not so joyous times) is all part of the tradition that we have in most Western cultures during this time of year. Be kind to yourself and remember that you are not alone. 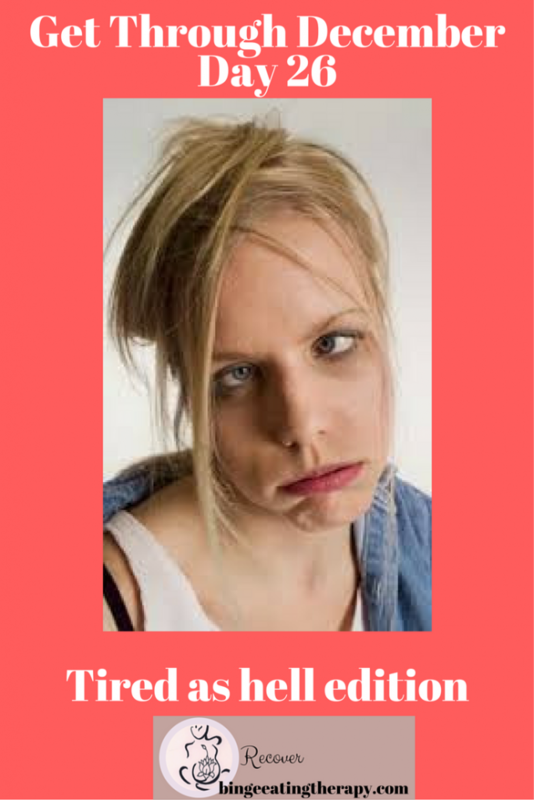 Everyone is feeling bloated and uncomfortable from having eaten lots of foods that they normally don’t and eaten more than they normally would. Be kind to yourself, drink lots of water and tea and get some loving exercise– brisk walk in the cold weather, a yoga class or some gentle stretching. Hi! I hope that you all had a great Christmas and are still having a great Hanukkah if you are celebrating those 8 crazy nights. And Today is Kwanzaa, so happy Kwanzaa if you celebrate it. I didn’t know much about the holiday so I did some research and learned that Kwanza is a holiday that celebrates community, connection with heritage and culture, and rising up from strife, oppression and persecution. So I hope that those of you who are celebrating have some wonderful plans for the day and enjoy your families and friends. Anyway, I explored with this reader a bit further and asked her if it was the crunch. She told me yes, that it was the crunch, and it was also nuts and then moved onto less nutrient dense foods. 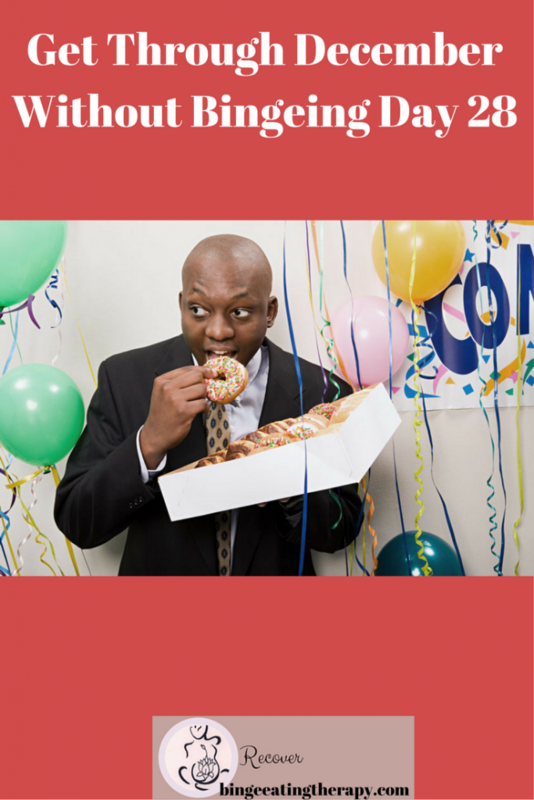 When I work with clients personally, I am always interested in what their binge foods are. What they choose to binge on and when is good information for me because it lets me know what they are choosing to satisfy physically and chemically. For instance, if you read my book– you might remember the first sentence? “It started with the bread. 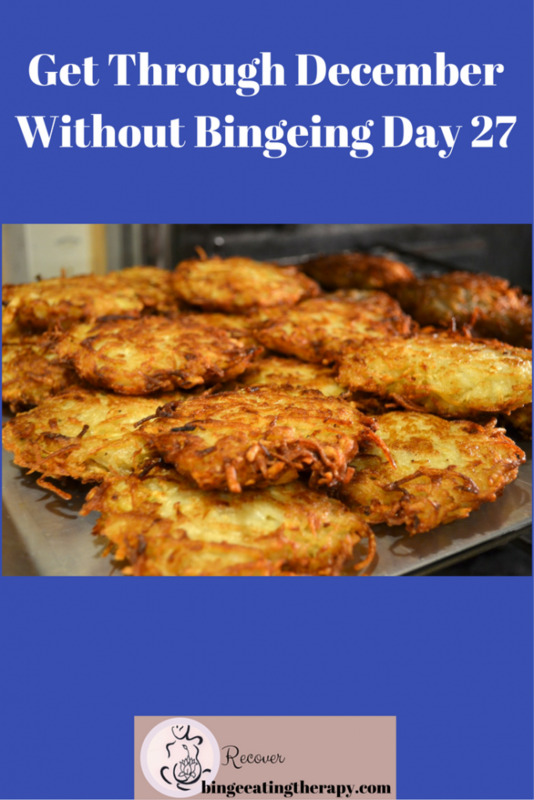 It always started with the bread.” My binge food was crusty bread. Why is that? Well bread is a very simple carbohydrate and it starts to digest instantly in your mouth with your saliva. So I began feeling the numbing effects of serotonin very quickly when I ate bread. It was like taking a valium. And the crustyness of the bread helped me to process emotions like anger and stress and anxiety because I was chewing so hard. What about you? Do you find yourself bingeing on crunchy foods, for instance cereal? Granola? Nuts? If so, I have a little trick for you. Did you know that your jaw is the strongest muscle in your whole body? And because of that, it takes on the responsibility of holding lots of your stress. So many people hold stress and tension in their jaws so eating crunchy foods is a way of releasing that. 1. Massage your jaw rubbing little circles right into the joints. 2. Let your jaw relax, don’t hold it open and don’t hold it closed, just let it come to a neutral position and take a few deep breaths right into it. Do this for about 60 seconds and you should find some peace. 3. Put a pillow over your mouth and scream as loud as you can into it. That will release jaw tension and all tension! Try it out and see how it goes. This is so true, we spend so much time trying to change our body so that we can change the way we think and feel about ourselves, but what if we bypassed that and just changed the way we think and feel about ourselves? We’d find that we had a lot more time and happiness in our lives. 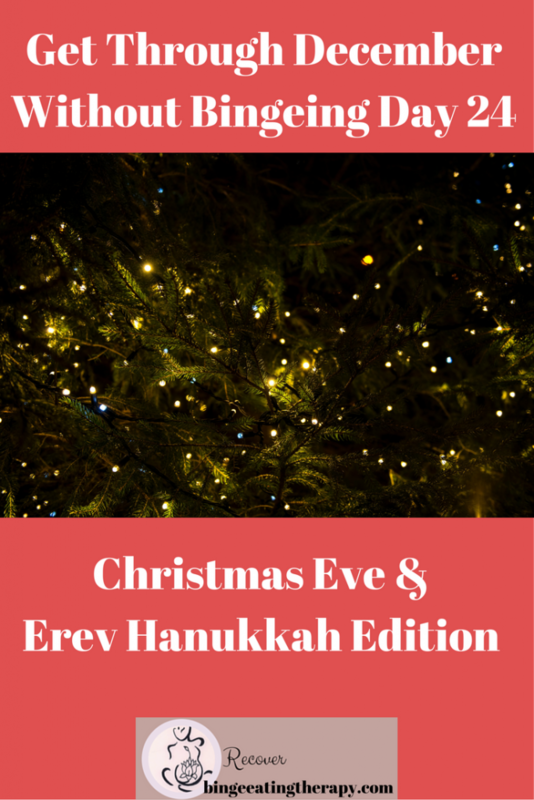 Happy Hanukkah and Happy Christmas Eve! Take it slow. If you are going to be with family tonight, I just want you to take it slow. Try to do your best to not react to their behaviors or things that they say. Remember it’s not the stress or the things that people say that cause you stress, it’s your reaction to it. And you have the power to choose how you want to react. Think about how you want to behave around food, around your family and how you want to feel. Now see yourself behaving that way and being that way. Close your eyes and imagine it. Make a plan for it and know that if you can see it, if you can see yourself reacting and behaving in a way that you want to, then you can react and behave that way. I love this quote because it reminds us that when we hold onto our anger and turn it inward it burns us and destroys us. We need to get it out rather than turn it in and push it down with food. Ways to get it out? Journal, write about it, talk about it, just get it out. Are you deep into the December crazies yet? Where you feel as though you are jumping out of your skin waiting for Christmas and Hanukkah and Kwanza et al? Either you’re super excited or super dreading it. But whatever it is, I’m betting you’re a little stir crazy by now. When you have nothing to wear. 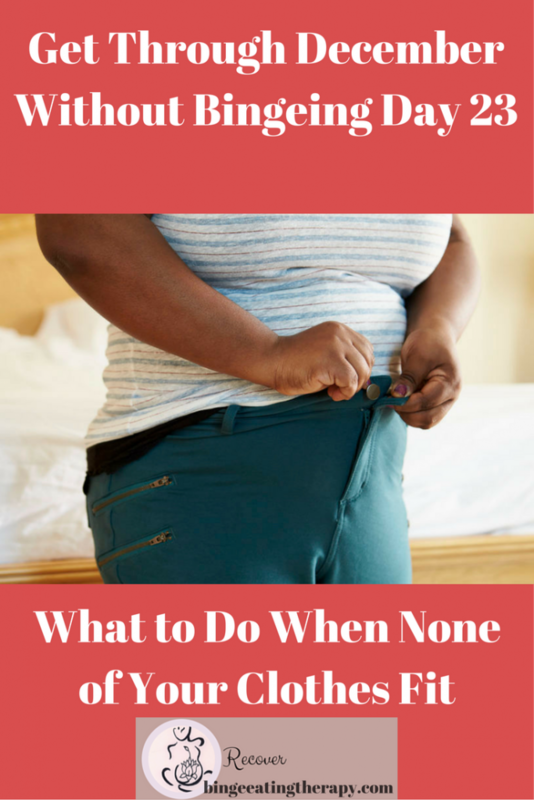 Hi Leora, Any advice about when the stress comes from not having anything appropriate to wear because nothing fits? It’s just about feeling bad about myself and not wanting to socialize. It takes so much energy. I have been there. My body and my clothes have been many, many, many different sizes throughout my disordered eating. This is what I have to say to you. As part of your recovery process, find clothes that fit you and are comfortable and make you feel beautiful. I know that shopping can be triggering in its own way when you are uncomfortable in your body, but I find it crucial in terms of self care to have things that fit you and that you love. You don’t have to lose weight to buy clothes, you just have to find clothes that fit you. When you are actively engaged in recovery, your body will return to its right and perfect size and will stay there and then you can have all the same clothes for as long as you want to. But don’t punish yourself by having ill-fitting clothes that are not comfortable in your house. That’s both punishing and depressing, of course you don’t want to go out when nothing fits you. Treat yourself and love yourself. You deserve it. You really do, no matter what size your body is at. In yesterday’s post, I asked people to send me specific questions that they want addressed in the December series. I got some great questions so I’ll be doing my best to answer over the next few days. Dear Leora, I am at work, and there is food EVERYWHERE. It’s the holidays, and people have brought in cheesecake, toffee, chocolates, brownies, cookies and cupcakes. I have put on weight because I cannot resist this food, and I feel ugly and terrible about myself. Do you have any advice for *not* eating this stuff? This is a big one at the holidays. People bring in baked goods and treats all the time. The office is full of sugary treats that make people happy- unless they have a dysfunctional relationship with food. Then it makes work a living hell. The way I work with clients around this specific issue is to help them create a healthy boundary around the holiday treats. For example. Someone might tell themselves that their healthy number for holiday treats is two each day. So what they can then do is plan what time they are going to go into the kitchen to get the treat. Perhaps it’s after lunch at 1pm. At 1pm, they walk into the kitchen or staff room and they take a look around and figure out what it is that they really, really want. They take that on their planned break, sit down and allow themselves to enjoy it. To taste it, to chew it to swallow it. Perhaps they enjoy that treat with a cup of tea and some music for a five minute break. Let yourself be satisfied and enjoy. Then, at 4pm, they can do it once more. Then you know that the next day you will have two treats again, so you don’t have to worry about getting everything in all at once. You have to figure out what your number is (maybe it’s one treat a day, maybe it’s three), but it’s important to plan ahead so that you don’t become black and white about it. If you for instance say that you aren’t going to have any and then you go into the kitchen and accidentally grab something– it might set you into a sneak eating, bingey tailspin. I do suggest that if you are able to though, if food is honestly everywhere, it would be a relief for you to allow yourself to eat a little bit of it in a controlled and moderate way rather than telling yourself no and then feeling out of control with it. It’s often in the restriction and the resistance where we find the most stress. Giving an allowance will reduce that stress. Another practical tactic is to keep a big bowl of apples on your desk. Here is why, for most people apples are not a binge food. 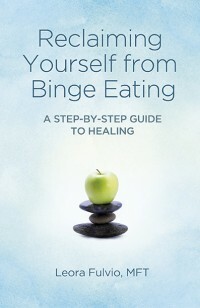 [But If apples are your binge food then read no more. Though in my two decades of treating Binge Eating Disorder I’ve never seen apples be anyone’s binge food, so I’d be surprised. If apples are your binge food, you have to reply and let me know]. 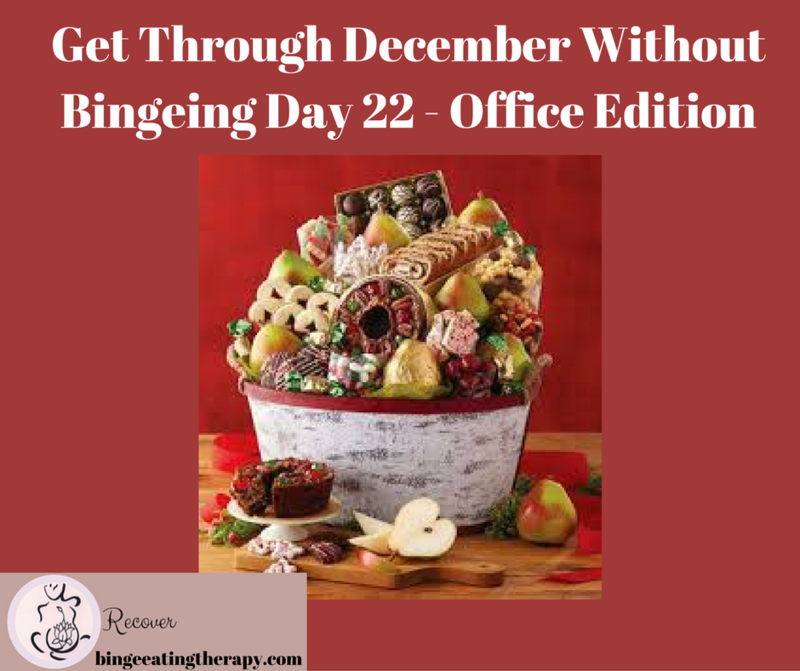 But I digress… the bowl of apples on your desk will be easy for you to grab, so if there is binge food all around you and it’s unavoidable, having a non-binge food at your disposal and easily reachable will help you to fend off a binge. I love this humorous quote by Somerset Maugham because it reminds us that sometimes “messing up” is just human. And that it’s the way that we react to the excess that will hurt us more than the excess. For instance, I ate a brownie- I’m so stressed out about it that I’m going to binge on more brownies- rather than- oh, I ate a brownie– it was great- Now I’m going to relax in a nice tube tonight and watch The Gilmore Girls.